It used to be that people “took offense at”; now people “are offended by.” The first implies that there is choice involved in your reaction to a perceived insult to your person or beliefs. You can ignore the insult — or “take offense” at it. But today there is acceptance of the idea that one should be, or at least act as if you are, offended by any idea that even slightly differs from one’s own beliefs. This is a product of political correctness and the dumb idea that everybody should be nice to everybody else. Personally, I find the whole concept of “being offended” insulting to my character. I choose not to be offended by anything anyone says about my beliefs and my character. To me, any insult says something about the person insulting me. I think how pathetic and weak-brained that person is. I choose not to be a victim. Nobody has to “take offense,” but if you wish to be a victim, and perhaps thereby gain sympathy or even compensation, and limit others their freedom of speech, then just go ahead, you sad excuse for a human being. As a young child my mother taught me, bless her, that “sticks and stones can break your bones, but words will never hurt me.” I believed her, so instead of crying at insults, I wondered at the diseased minds of those offering insult, and laughed at them. Not that I think that insult does not have its place — far from it. I regard insult rather like graffiti in that some walls deserve it. But it is not the giving you should worry about — it is the acceptance. As captain of a liveaboard and cruise director on others, I have often been in the position of receiving complaints about other passengers. The complainer usually states that he or she has been offended by the behavior or opinions of others, and expects me to sort it out. One passenger was offended by the fact that another passenger had put his dive bag on top of hers. I did not know what those dive bags were up to, but I gave them the benefit of the doubt, and assumed the complaining guest was, in fact, nuts. Of course, running a liveaboard entails diplomatic skills Henry Kissinger would be proud of, so I came straight out with it. “You’re nuts! 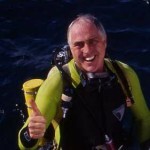 Go diving before I throw you, and your bag, overboard.” Amazingly, the reputation I gained by acting swiftly and firmly irapidly reduced the number of guests becoming “offended.” True, some found my response offensive, but I made it clear that it did not bother me — it was their problem. I could recommend this type of response to any political party. Instead of trying to introduce legislation to make the giving of offense illegal, they should be making the taking of offense illegal. Silly people, why do they always get it wrong? So then I started to think of behavior on any dive boat I was running that I would consider, if not offensive, then at least in bad taste — or more importantly, behavior that would detract from the fabulous experience my guests would otherwise experience under my guidance. Selfish behavior would seem to be top of the list. Someone who scoffs down more than their fair share of the delightful gourmet delicacies provided between meals; insists on inflicting on everyone else their appalling taste in music on the ship’s sound system; always pushes to the front of the line to get in the water first; elbows through the crowd around the sea fan with the pygmy seahorse to make sure they get their photo, then hogs the spot; keeps going on about wind turbines, and how useless and ruinous they are (whoops, that’s me); or crashes into a photographer shooting a critter he or she had just found, disturbing the critter and stirring up a fog of silt and sand. Then there are those who insist that their dive bag is kept in place, blocking the saloon, as it contains essentials they simply cannot have on board without immediate access; or come to dinner without a shirt on (I think this holds the record for the number of complaints I have received). 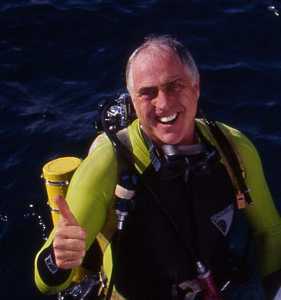 More obscure are complaints about divers washing their wetsuits in the camera dunk tank, but I have indeed heard them. My advice to those of you who find yourselves confronted by potentially offensive behavior is this: Don’t take offense, take revenge. I’m actually all for forgiveness — but only after I have had revenge. It is in my stars, but of course as a Scorpio, I do not believe in any of that astrology nonsense. In Papua New Guinea, “payback” is the embodiment of the revenge principle. Basically, if you do something that offends someone, then he, or his clan, will do something back to you (or someone who looks or speaks like you) more terrible than you did in the first place. This means you have to pay back the payback with an even more terrible deed, and so it escalates until a peace meeting is held where compensation is handed out. Then more fighting breaks out over the size of the compensation. A recent front page in a Port Moresby newspaper reported that 10 people were killed when fighting broke out after a peace ceremony. So keep the revenge petty, not serious. This use is much underrated in today’s society, but I used it regularly on board. To the foul-mouthed braggart, smear a little vegemite on his mouthpiece. To the pusher that always has to be first in the water, try popping his dive skin in an old ice cream container filled with water and place it in the freezer overnight. To the one whose bag is always in everyone’s way, move it then put some heavy (greasy) gear on top of it to make it inaccessible. And so on. Use your imagination. The wonderful thing, of course, is that you can pretend it was just a joke and laugh it off. This puts the offender in the difficult position of not wanting to appear a bad sport, while seething with anger. Oh my, what fun! It is not likely that they will “get it,” but it will make you feel much better. Please note that I am absolutely not suggesting physical violence, merely a harmless means of dissipating your frustration and not getting offended. I admit I have witnessed rare fistfights break out between guys offended by each others’ behavior or viewpoints. And it is true that now and then, two people will come aboard who are totally incompatible, and then my best ploy has been to keep them separated. You would think that with diving as a common denominator, life on board a dive boat would be totally congenial, and mostly it is. But if you are confronted with behavior, or hear an opinion that you find at odds with your own mores, by all means, try to get the behavior modified — sometimes a gentle word does wonders. But whatever you do, do not take offense. I’d find that offensive. It seems as though you’re offended by people who take offense? I say shut up with your offense and deal with it! As a liveaboard operator, that’s your job! People have the right to do stupid things with their equipment, for example, but not if it damages my equipment. If so, I’m going to complain. I’ll say something to the offender first, but if that doesn’t work, as the operator of the boat, I feel it’s your job to take that person aside and instruct him or her in proper etiquette. Look, people aren’t going to always get along, and when someone “takes offense” at something someone else does, it’s because the offender has done something that the offendee feels is beyond the bounds of reasonable behavior. This is especially true if someone does something that affects the other person. I’m sure you see more than your share of people taking offense at petty things they shouldn’t, but to act as though everyone everywhere should never get upset at the ignorant behavior of others is simplistic to the point of stupidity. Bob states the obvious so well and with such clarity that he is sure to offend exactly those who live only to take offense at something. Good on ya, mate!